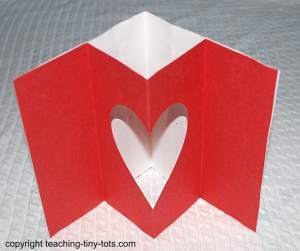 Toddler Activities: A simple heart card with a little suprise when you open it! Fun and easy for toddlers to help. Easy card for classroom activity with just construction paper and glue. Fold white piece of construction paper in half. Fold red piece of construction paper in half and again to make it into fourths. Open the red construction paper so it is again in halves and draw a heart so that the widest point is 3.5 inches across. When the red paper is opened it should be in the middle two fourths of the paper. Open card and put glue on each end of the white construction paper. Place the red construction paper on the inside. The key to it "popping" up is the way the red piece is folded. See picture at very top for best results. This car is easier to visualize than to explain in writing. Embellish the heart on the front with glitter. Write recipient's name in the heart.